Comment This year’s bid by Google to fill your home with its tat collapsed like a soufflé yesterday – but at least one part will have a huge impact. In the phone world, the impact of its Pixel brand on its partners will be huge. Google had hyped the consumer event as the biggest since Android’s launch, but since it added only one new product to what is really a diminishing range of consumer experiments, the hype almost guaranteed fanbois would be disappointed. Google keeps trying to make consumer hardware. The ad giant thinks it’s a cool idea, but because it's mostly brilliant software engineers who like toys, but rarely see the light of day, it's doomed to fail. Our homes are filled with cheap consumer electronics tat, but most of it is not made by Silicon Valley and maybe never will be. So consolidation, rather than expansion, was the theme of the day. Note that before yesterday, Google flogged phones, cheapo VR nerd goggles, a home Wi-Fi router, a TV dongle and audio gear. Now Google flogs phones, cheapo VR nerd goggles, a home Wi-Fi router, a TV dongle... and a spy mic, just like Amazon Echo! Some parts of the product range have been upgraded and rebranded, but it hasn’t got any bigger or more ambitious: Google has been taking an axe to some of the wilder consumer initiatives like Chromecast Speakers, while Google Cast is in a deep coma. Belkin and Logitech sell a wider range of home tat. If you’ve been waiting for Google to shake up consumer electronics, then you’re still waiting. Google now justifies hardware products on much narrower and more utilitarian grounds: they’ve got to be a vessel for increased data collection, sold on the pretext of being “smart” or containing “AI.” The scare quotes are not accidental: this is not AI. But what Google calls AI – wouldn’t you know? – needs hods of personal data that Google couldn’t collect before. Amazon Echo impressed owners - like this one - because of advances in NLP, not "AI". Amazon is a shop, not an ad broker, so the trust relationship with consumers is quite different. And Google seems just as careless about quality. 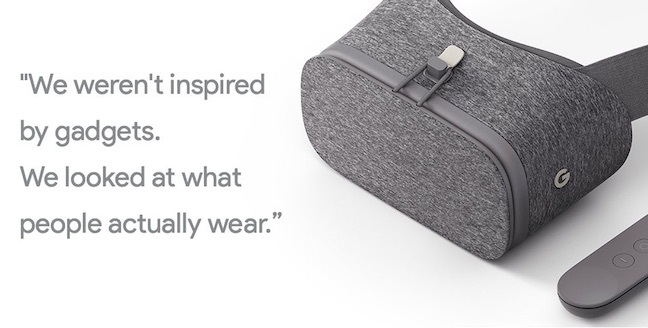 As reviewers have noted, Daydream View, the successor to the Cardboard project, is still mostly Cardboard. As Rob Price points out in his hands on, you don’t need to great graphics to do VR adequately: the graphics could be Tron-basic, or even stickmen, so long as the latencies are low so you don’t feel sick, the feedback is good, and the game worlds imaginative. But Cardboard 2.0 fails on all these counts. VR is still bifurcated into the expensive (Vive, Oculus) systems which know where you are, but tether you (and require a huge PC and take a day to set up)... and the cheap and cheerful Viewmasters that are very popular with primary school children right now. Those start at under £15 in the UK. Daydream VR is £69 – the same as Samsung’s Gear VR – but you need a Google Pixel phone. Daydream doesn't know where you are. So they may as well give it away. Yes, correct: lots of people like to walk around with a cloth box covering their eyes, so they can’t see where they’re going. Go ahead and copy it, Google. Great idea! In another instance, a product demonstrator on stage noted that the Cardboard 2.0 case had a flap to hold the Daydream VR’s remote control. “It’s that attention to detail,” he cooed. What, as opposed to the remote just rattling around inside? So much for the home tat. "It’s Google’s autistic approach to relationships," one senior phone executive told me at the time. "They don’t know what hurt they’re doing, and they don’t care." This angst abated when it became clear that Google wasn’t serious about the mass market – Nexus distribution was constrained, so you had to try really hard to get one – and Google wouldn’t hog platform features exclusively for its own phones. Before it launched, the Nexus was touted as a “superphone,” but it wasn’t all that super. As of today, neither of these constraints is true any more: Google will pack Pixel phones with exclusive goodies, and it’s going to put Pixels everywhere. To get the latest Android (7.1), get a Pixel.